In March 2018, Flip the Fleet (FTF) published a paper on the reported battery degradation of the 30 kWh Leaf. Since this report, Walter Larason of EVs Enhanced has carried out nine energy holding capacity tests on a dynamometer which showed that most of them held more energy in their battery pack than was reported by the car’s Lithium Battery Controller (LBC). In June 2018 Nissan released a service campaign for its UK and USA customers, where the firmware of the car’s LBC can be upgraded in 30 kWh cars manufactured from December 2015 to August 2017. The upgrade applies to LBC firmware versions ending in 4A, 4B, 5A and 5B. This update purports to correct the reported State of Health (SoH) of the car and correct the underestimation of range. We first compared the SoH reported by the LBC before and after the firmware update had been applied to 11 Leafs. After the firmware update was installed, reported SoH increased by up to 17 percentage points. This correction to SoH was bigger for cars with most degraded batteries, and we derived an equation that almost exactly predicts the change in SoH should the firmware upgrade be installed. We then applied this correction based on the equation to EVs Enhanced’s dynamometer test results to simulate a ’virtual update’ of their instrumentation to test whether the firmware would lead to better estimation of the energy holding capacity of the seven test vehicles with firmware 4A. Once the correction was applied, there was a close match between the energy stored in the battery as measured on the dynamometer and the energy reported by the car’s LBC, for all seven vehicles with firmware 4A. We therefore conclude that the recently available update is a genuine and accurate fix to the reporting problem identified in FTF’s March 2018 report. One can think of this correction as an improvement in the accuracy of the car’s fuel gauge, including a recalibration of how big the “tank” a Leaf has when fully charged, and the way this degrades as the car gets older. This equation allows FTF to retrospectively apply the same “virtual update” to all the historical measures of SoH supplied by 151 owners of 30 kWh Leafs in the FTF database. The corrected SoH values decline at virtually the same rate as the 24 kWh Leafs. There is no longer any evidence of a statistical difference in reported SoH between the variants once the firmware upgrade is applied over the first 2.5 years since 30 kWh Leafs were manufactured. We therefore conclude that much of our earlier concern about rapidly declining reported SoH stemmed from an instrumentation error rather than degradation of the battery itself. There will be a need for careful documentation of the firmware being used to report SoH of 30 kWh Leafs imported in future or resold within New Zealand, so that sellers and purchasers are not misled about the range and stage of degradation of the battery. The instrumentation bias reduces the practical use of the vehicle, so it will be important for New Zealand 30 kWh Leaf owners to have access to the corrected and compatible firmware. The requirement for a firmware update for many of the 30 kWh Nissan Leafs in New Zealand has highlighted the need for support of used car imports by the manufacturer, their in-market representatives, or the New Zealand importers. It is the opinion of the authors that the most appropriate agent to manage the update of the affected 30 kWh Nissan Leafs is Nissan New Zealand using their nationwide dealer network. In summary, at least part of the earlier concerns about premature decline in battery capacity in early 30 kWh Leafs has been allayed. There is clear evidence that some of the reported degradation stemmed from instrumentation error rather than reduction in the actual energy holding capacity of the batteries. This is encouraging news because firmware upgrading is a simpler and less expensive fix that battery replacement or refurbishment. In March 2018, following numerous enquiries from concerned 30 kWh Nissan Leaf owners in New Zealand, we published a preprint “Accelerated Reported Battery Capacity Loss in 30 kWh Variants of the Nissan Leaf” . 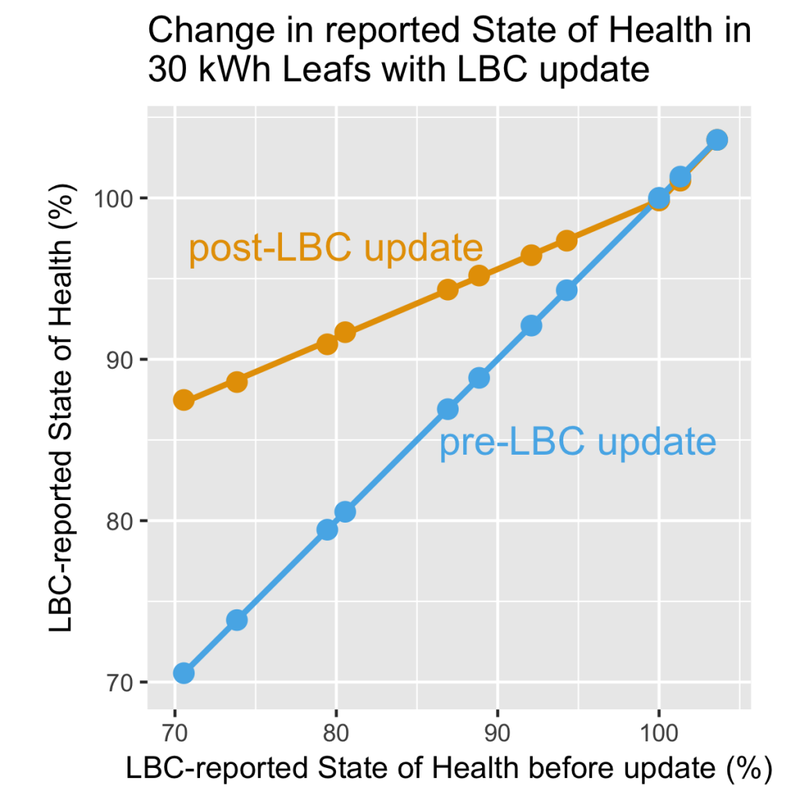 In data collected from 24 kWh and 30 kWh Nissan Leafs, the State of Health (SoH) reported by the Lithium Battery Controller (LBC) was declining faster in 30 kWh Leafs compared to 24 kWh Leafs (Figure 1). In July 2018, Nissan released a Customer Service Campaign in certain markets to reprogram the lithium-ion battery controller of the 30 kWh Nissan Leaf to correct an error in calculations of range and battery capacity , and the upgrade applies to firmware versions ending in 4A, 4B, 5A and 5B. We are working on version 2 of our preprint and here include a preliminary summary of new results that will likely form part of this update. These results require further scientific review and are subject to change. Figure 1: All individual battery State of Health (SoH) measurements as a function of age with average 2nd-degree polynomial fits for both 24 kWh and 30 kWh models. Nissan’s estimate for decline is 80% SoH after 5 years and is shown by a red dot. There was large variability between cars, but both battery models showed increasing decline in reported SoH with age, with a faster decline in 30 kWh compared to 24 kWh Nissan Leafs. The graph presented here has been updated since initial publication in the Preprint  to include all 2,600 SoH measurements submitted to Flip the Fleet so far. Since our initial publication, Walter Larason (from EVs Enhanced, http://evsenhanced.com/) has performed nine tests of the energy holding capacity of nine 30 kWh Nissan Leafs using a dynamometer and a protocol based upon the IEC62660-1 standard. Briefly, the method first standardised the battery to be around 25°C and to be at full charge, before the car was discharged at C/3 Amps (27 Amps) on a dynamometer until the car stopped. The time that it took to fully discharge the battery allowed EVs Enhanced to calculate the total usable electric charge in amp hours (Ah). This was then divided by the implied Ah of a battery at 100% SoH to get a capacity-tested based SoH. It was found that there was a systematic bias for the LBC-reported SoH for cars with the earlier firmware revision 4A to be lower than the SoH as calculated from the battery capacity testing (Figure 2). In comparison, although only two cars with the later 6A firmware were tested, one was very close and the other higher, than the SoH as calculated from the battery capacity testing. In most cases for cars with firmware 4A, more energy remained in the battery below the “Very Low Battery Warning” than the cars’ instruments were reporting, so the driver was warned to stop and recharge before absolutely necessary – when in fact, the driver could have kept on driving for some distance yet. Figure 2: Battery State of Health determined from battery capacity testing compared to the Lithium Battery Controller (LBC) reported State of Health. The black line represents where points should be if there was a perfect match between LBC-reported State of Health and capacity-tested based State of Health. 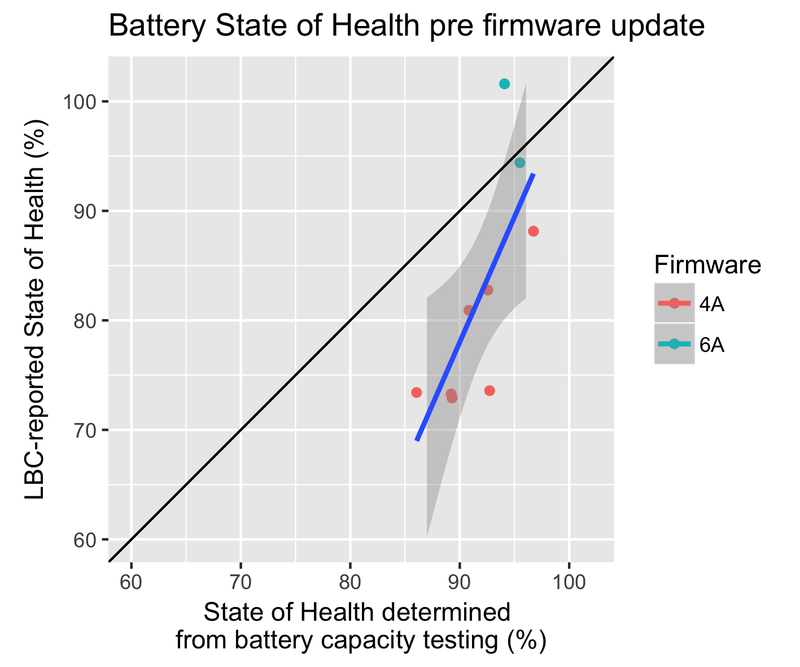 The LBC-reported State of Health for cars with the earlier firmware revision 4A, which the update applies to, was consistently lower than the State of Health as calculated from the battery capacity testing. The shaded region around the line of best fit represents the 95% uncertainty interval for the relationship. Data collected and provided by EVs Enhanced. EVs Enhanced obtained the 4C firmware update that has so far been applied to Leafs in the US and the UK. This firmware update has been applied to Leafs over recent weeks by EVs Enhanced and the LBC-reported SoH before and after the update recorded in 11 cars (Figure 3). This demonstrates that the change in the LBC-reported SoH following the update follows a simple linear relationship with almost no variance up until 100% is reached. The consistency of the correction factor makes it possible to predict what the SoH of a car would be after the update without actually performing the update. Flip the Fleet has now applied the correction equation to recalculate the LBC-reported SoH for all firmware revision 4A 30 kWh Leaf’s that were tested on the dynamometer (Figure 4). This shows that the firmware update successfully corrects the systematic bias found earlier (Figure 2). If you compare the shaded area in Figure 2 and Figure 4, it is evident that the statistical uncertainty associated with the tests now spans the black line where the cars’ instruments coincide exactly with the amount of energy stored in the full battery. On this basis we conclude that the firmware update has definitely improved the car’s estimation of SoH. Now that the LBC-reported SoH calculation has been improved, and we have an equation based upon Figure 3 that describes the correction expected for each car, Flip the Fleet can retrospectively apply the correction to all the historical SoH measures from cars with the 4A, 4B, 5A, and 5B firmwares (Figure 5). Following the update, the predicted mean SoH for 30 kWh Leafs is now similar to the curve for the 24 kWh cars. Statistically there is no evidence that the decline curves are different between variants. Figure 3: Change in the LBC-reported State of Health with LBC update. In general, for cars that have a State of Health that is less than 100%, there is a linear relationship in the increase in State of Health, with cars with a lower State of Health having a greater increase in State of Health following the update. Data collected and provided by EVs Enhanced. 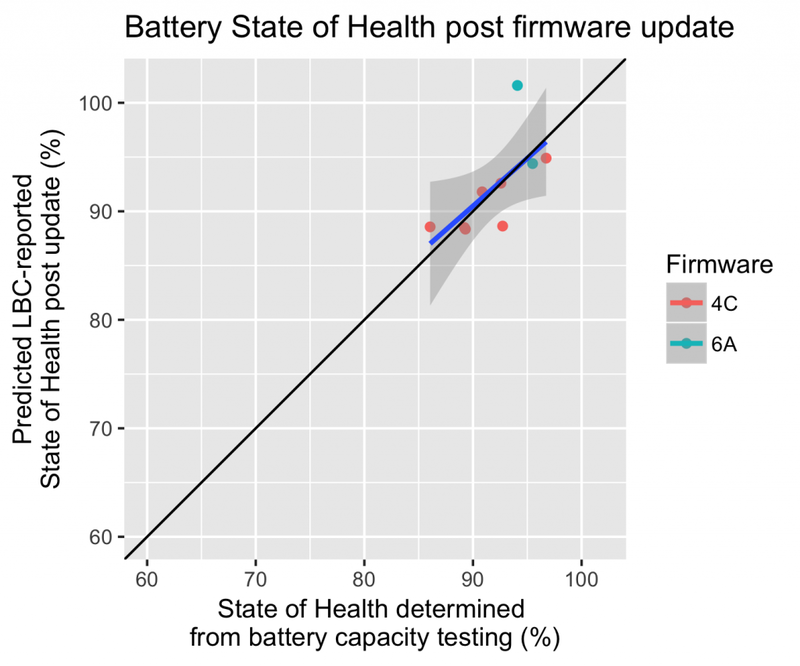 Figure 4: Battery State of Health determined from battery capacity testing compared to what we predict the LBC would report for State of Health should the firmware upgrade be applied to Leafs with the 4A firmware. 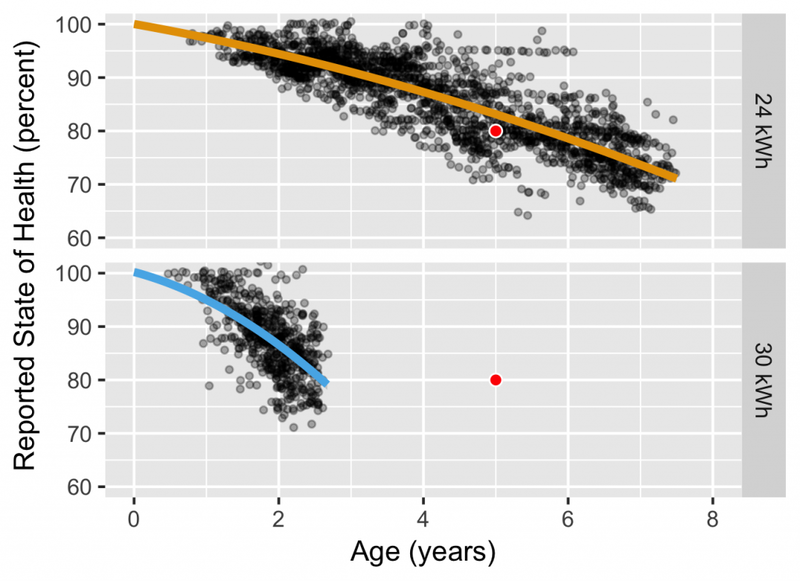 The black line represents where points should be if there was a perfect match between LBC-reported State of Health and capacity-tested based State of Health. The LBC-reported State of Health if these cars were updated to revision 4C is predicted to be much more consistent with the State of Health as calculated from the battery capacity testing. The shaded region around the line of best fit represents the 95% uncertainty interval for the relationship. Figure 5: Comparison of the decline in mean battery State of Health in the 24 kWh compared to that observed in 30 kWh Leafs without the firmware update, and now predicted for 30 kWh Leafs should they receive the update. 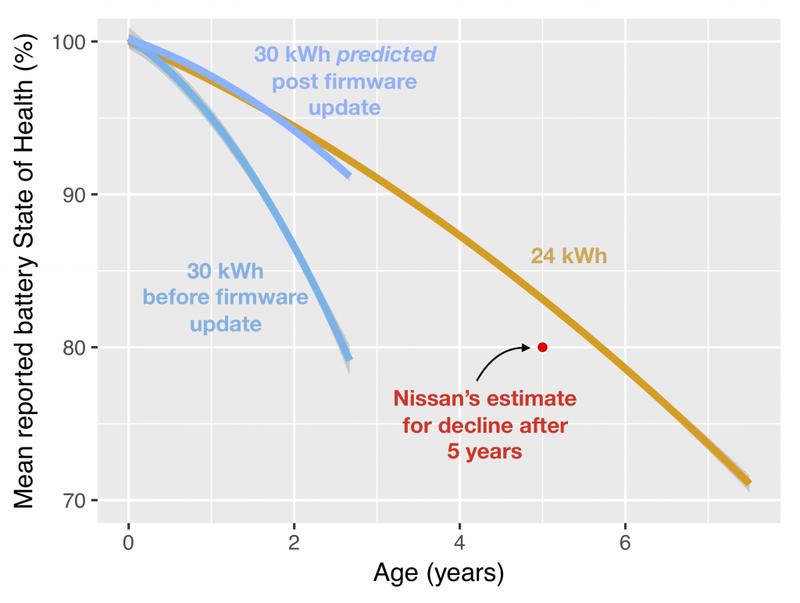 Once the 30 kWh cars with the 4A, 4B, 5A, and 5B firmwares are transformed given the relationship observed in Figure 3, then there is no evidence of any significant difference in the decline of State of Health between 24 kWh and 30 kWh Nissan Leafs. The data we have available so far indicate that there was a systematic bias in the 30 kWh Nissan Leaf Lithium Battery Controller firmware version 4A. This leads to under-reporting of the battery capacity available, expressed as % SoH or the number of remaining battery capacity bars. The 4C firmware update released by Nissan in USA and Europe appears to have resolved this systematic bias. Nissan also claim that the revised firmware adjusts the estimate of total distance remaining as the car’s battery depletes during each journey between charges, although we have not completed investigating this at this stage. One can think of this latter correction as an improvement in the accuracy of the car’s fuel gauge, whereas the SoH correction is a recalibration of how big a “tank” the Leaf has when fully charged and the way that this degrades or “shrinks” as the car gets older. The instrumentation bias reduces the practical use of the vehicle so it will be important for New Zealand 30 kWh leaf owners to have access to the corrected and compatible firmware. Flip the Fleet will continue to monitor the future trajectory of SoH measures in all variants of Nissan Leafs irrespective of whether they have received the firmware update or not. Prediction of the longevity of the batteries is impossible because it is new technology and scientific information on the chemistry and tests of performance of the batteries is not publically available. In particular, this firmware fix does not preclude that there could be other potential issues with the 30 kWh batteries, or 24 kWh batteries too for that matter, that may become evident in the future. The requirement for a firmware update for many of the 30 kWh Nissan Leafs in New Zealand has highlighted the need for support of used car imports by the manufacturer, their in-market representatives, or the New Zealand importers. In the meantime, at least part of the earlier concerns about premature decline in battery capacity in early 30 kWh Leafs has been allayed. There is clear evidence that some of the reported degradation stemmed from instrumentation error rather than reduction in the actual energy holding capacity of the batteries. This is encouraging news because firmware upgrading is a simpler and less expensive fix than battery replacement or refurbishment. All authors are owners of Nissan EVs. Flip the Fleet has the goal of encouraging the uptake of EVs. EVs Enhanced provided the data for the battery capacity testing and pre and post firmware update State of Health measurements and also offers the firmware update as a commercial service. At the time of making this update, Flip the Fleet is not aware of identical testing procedures being carried out by another independent body. As such, the data presented for retrospective correction of battery SoH measures is based on results provided to us only by EVs Enhanced. Flip the Fleet doesn’t endorse or recommend services of any commercial entities. If you are a 30 kWh owner, you need to consider the benefits and risks associated with getting an update done by a third party and that this report is merely to present the latest research and findings. This is indeed some very good news. Thanks to flip the fleet and Walter for all their wonderful work in supporting EV in NZ. If only Nissan dealerships could do the same thing it would go a long way to improving customer relations. Just curious whether the data submission form on FtF will be updated to include whether the fix has been applied? Excellent Question. In most cases, based upon the data entered, we can determine if the fix has been applied so we won’t need to clutter the submission form with another question. I would love to know if the UK firmware is being installed directly into the Japanese LBC, or whether it has been reverse engineered to find the changes and used to patch the Japanese firmware? Has EVs Enhanced done a comparison of the UK/US and Japanese 4A firmwares to see if they are indeed different? Nice work by Walter but Nissan NZ needs stand up and offer the update officially. I guess I’ll put it off for as long as I can and see what happens with an official “JDM” version. I hope this is positive. Well done to everyone involved for all the time and effort put in to creating this very meaningful result! I have an early 2016 30kW with just 7,583 UK miles on the clock. Based on your algorithm do you think I should call my dealer and get the update? Or just wait for the next service which will be in about 9 months time? I’m unlikely to take the battery below 20% as I live on a small island (Jersey). Hi. The report says that the improvement to SOH can be predicted with a formula. As more cars are being updated Is this predicted improvement holding up and is it consistent across UK and JDM leafs that have had it applied? Can you disclose the formula or put a predicted SOH calculation on the website for registered users? You might recall my email from March where I told you that my 30kWh Leaf was losing battery capacity – dropping to 82% SOH from 93% in the five months since I bought it. Since discovering the drop in SOH I have been emailing the dealer (AutoLink) and they have gone from telling me to relax and enjoy my Leaf to offering me a full refund. This was in March. AutoLink then reversed their offer of a refund, claiming all sorts of things and suggesting various tests & interventions while still denying there was any problem with the car. Eventually, I had enough and decided to take my case to the Motor Vehicle Disputes Tribunal. Obviously events overtook this somewhat with Nissan’s announcement but the outcome was that the MVDT issued a Consent Order at the end of June that ordered AutoLink to “update the vehicle’s software to rectify the fault that causes the vehicle to display a battery capacity less than the actual amount, at it’s [AutoLink’s] cost, and within three months of the order”. Happy to report that Walter has just done my update a couple of days ago at no cost to me and my SOH has returned to 90% (yay!). I have just emailed you this Consent Order separately, as perhaps you may wish to share this document with other owners of 30kWh Leafs (I have cleared this with the MVDT). I think my case sets an important precedent for others in a similar situation to mine, and I hope it goes some length to ensuring other 30kWh Leaf owners have a much more pleasant experience should they wish to request this “update” from their dealers. I would be very happy to save fellow Evangelists some time, money and nerves. Using the formulate above for the 30kwh battery upgrade and assuming I’ve calculated this correctly, my current SOH of 78.06% should rise to approx 90.57%. A trivial question but I’m interested to know whether I’ll get my 12th bar back when I eventually get this upgrade? In respect to Miriams reply above, I also purchased a 30kwh Leaf from Autolink Cars and my SOH dropped from 96% to 84% in less than 3 weeks from purchase and now 6 months later fluctuates around 77% – 78%. I have been in contact with Autolink Cars many times since purchasing the car and they have always stated that this drop in SOH is quite normal for 30kwh Leafs. They are also adamant that I must pay the $250 for the upgrade. Thank you Miriam for the information you provided above, and Dima and Henrik for sharing the information. I will be stopping at Autolink Cars on my way home from work. Yes, you will get your 12th bar back when you get the update. I previously leased a 2013 SV for three years. I live in a temperate climate in North America (Seattle) and turned my car in with 43k miles and 12-bars. I then leased a 2016 SV. Because I LeafSpy, I was aware that the SOH was deteriorating much more quickly in the 2016 than it had in the 2013. My 2016 now has 11 bars and 81% SOH. This was very disappointing to me because I had such experience with my 2013. I’ve not yet done the upgrade but plan to now that I’ve made some measurements on the 2016. I read with great interest the formula for adjusted SOH post-update. I then applied the formula to my 81% SOH and found it would get taken to 91.8% which will restore my 12th bar. My 2016 has 36k miles on it, when my 2013 had 36k miles on it its SOH was 92%. The 2013 and the 2016 have essentially identical utilization and driving habits. My data supports your notion that the corrected 2016 SOH curve will match the 2013 SOH curve at least for my cars and use case. I found it remarkable that the match was so close. By the way, I also meant to commend you for the fine work in this paper and your enthusiasm for changing the way the world drives. Very well done! Thank you for your kind words Jeff. Do you have any explanation as to why the software update would make a larger difference in values for batteries that are more degraded? I cannot think of any reasonable explanation.